After nearly three-and-half years of conducting behind-the-scenes research, Kristina DePue was suddenly overcome with emotions earlier this month when she was thrust into the spotlight in her field of counselor education. “Honestly, I broke into tears,” DePue said when she received one of the most prestigious awards given annually by the American Association for Counselor Education and Supervision (ACES). 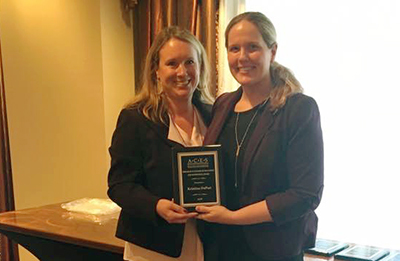 DePue, an assistant professor of counselor education at the University of Florida College of Education, accepted the Research in Counselor Education and Supervision Award at the southern region ACES conference in New Orleans attended by scores of her peers from across the country. DePue was the lead author of a research project that measured the strength of the relationships between graduate student counselors and their supervisors, as well as the relationships between these students and their clients. The clients are people who come for therapy because of they are under mental distress, such as depression, anxiety and suicidal ideation. Professors in the studies provided live clinical supervision of graduate students, as is typical in counseling education. The report, titled “Investigating Supervisory Relationships and Therapeutic Alliances Using Structural Equation Modeling,” is slated to appear in the December issue of ACES’ Counselor Education and Supervision, a leading journal in the counseling field. The study found counseling trainees who reported strong relationships with their supervisors also had the strongest relationships with their clients. In a follow up study, DePue and her co-authors discovered that both the relationship between the client and counselor, and the relationship between the counselor and supervisor predicted client improvements. Counterintuitively, DePue’s studies show these relationships work independently of each other. While these findings may seem obvious, they are not linear — in contrast what was previously thought. Instead, the two relationships (supervisor-supervisee and client-counselor) work independently, though both directly impact client change. DePue and her co-authors are submitting this second study to the Journal of Counseling and Development. Although the importance of supervision is undeniable, few researchers have investigated the influence of the supervisor-supervisee relationship on whether clients’ distress is lessened in therapy, Jacqueline Swank, UF assistant professor of counselor education, wrote in a letter nominating DePue for the award. DePue came to UF in 2013 after earning a doctorate in counselor education from the University of Central Florida, where data for the study was collected. The project had the participation of 169 master’s-level counseling trainees and 253 clients served by UCF’s community counseling center. DePue led a team of three other researchers: Ren Liu, a doctoral student in the UF College of Education’s Research and Evaluation Methodology (REM) program, Glenn Lambie, a professor of counselor education at the University of Central Florida, and Jessica Gonzalez, an assistant professor in counseling and career development at Colorado State University.